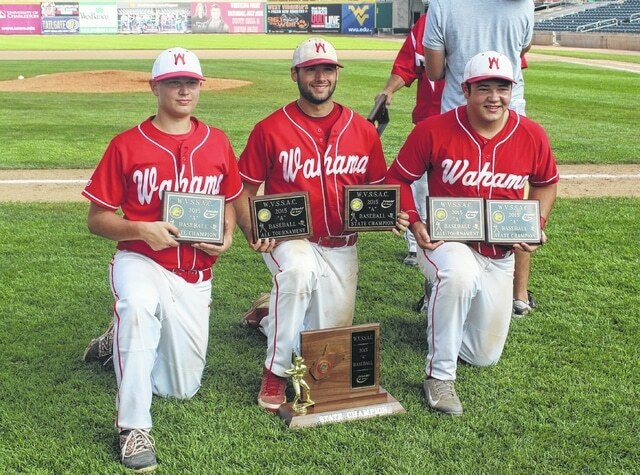 Recent Wahama graduates Kristopher Clark, Garrett Miller and Demitrius Serevicz, from left, pose for a picture with the 2015 Class A baseball championship trophy after winning their final high school contest Saturday with a 7-0 decision over Man at Appalachian Power Park in Charleston, W.Va.
Wahama seniors Kristopher Clark, Demitrius Serevicz and Garrett Miller are living the rarest of dreams after ending their collective prep careers Saturday with a 7-0 victory over Man in the 2015 Class A baseball state final at Appalachian Power Park in Kanawha County. The trio of recent WHS graduates have been involved in the White Falcon baseball program since their junior high years, and each has had a varying role with the varsity program over the last four seasons. The sacrifices and hard work, however, paid off in a big way — and that was even before Saturday’s victory. Since the spring of 2012, the White Falcons have claimed four consecutive Section 4, Region 3 titles, two straight TVC Hocking crowns and the program’s first regional championship since 1998. Wahama blitzed through the 2015 postseason by posting five shutouts and winning seven games by a collective tally of 72-7, which also included a 76-24 advantage in the hit department. The White Falcons also scored three-or-more runs in one inning of each of their seven tournament victories and committed only four errors total. So now, after all of the heartache and setbacks, three proud Wahama graduates head out into the world already perched high on the mountain. That hump, coincidentally, may have come in the Region 4 semifinals during a 6-4 victory over host Charleston Catholic at Triana Field. The Irish had previously knocked WHS out of the Class A tournament four of the previous six years. In following his first comment, Miller was asked to try express what being a state champion meant to him at that moment. Both Miller and Serevicz were starters on the Wahama football team that defeated Madonna in overtime for the 2012 Class A championship at Wheeling Island Stadium. The White Falcons are also the last Tri-Valley Conference boys team — Ohio or Hocking Division — to win a state championship for the league. It also helped the Wahama cause in seeing so many familiar faces showing support this weekend, at least according Serevicz. This memory will always run a little deeper for Clark, both personally and for his skipper — Tom Cullen. Miller was also happy for his baseball mentor, but in actuality was thinking more of the Bend Area when reflecting on what this title meant overall. Miller, Serevicz, Philip Hoffman and Mason Hicks also represented Wahama on the Class A all-tournament team for the 2015 campaign.